From the moment that Donald Trump set foot on the Trump Tower escalator, the promise of mass deportations for undocumented immigrants was a pillar of his presidential campaign. This is one promise that the current administration has managed to keep, with ICE enforcement efforts skyrocketing since Trump took office in January 2017. While the president's executive orders on immigration have played well with his political base, they've caused havoc with a number of US industries, from tourism to construction. But nowhere are the detrimental effects of these policies more clearly illustrated than in the agricultural sector. What's more, the current state of agricultural automation appears woefully unprepared to fully supplement the loss of migrant labor. Sindhuja Sankaran, assistant professor in the Department of Biological Systems Engineering at Washington State University, points out that a majority of automated agricultural systems still require human oversight. "The seeding is done in automation," she told Engadget. "The harvesting is done in an automated manner. There's still a person driving a tractor or machine." No matter how much progress we make with automation, Sankaran continued, humans will need to remain involved in the decision-making process, at least for the foreseeable future. And given that virtually all tree-fruit harvesting is still performed by hand, the sudden elimination of human labor could prove economically disastrous. "Farmers are afraid they won't be able to harvest what they plant," Steve Ammerman of the New York Farm Bureau told The Atlantic last year. "It means food prices are going to go up, hurting national security." We're not talking about a few dozen farm hands being deported back across the border. According to a 2017 Pew Research Center study, the number of undocumented immigrants living in the US in 2015 totaled 11 million people, or 3.4 percent of the country's overall population -- down from the 2007 peak of 12.2 million (4 percent of the national total). They've primarily settled in California, Florida, Illinois, New York, New Jersey and Texas. Eight of those 11 million immigrants were employed in the civilian workforce in 2015, contributing an estimated $11.6 billion to the US economy, according to the Institute on Taxation and Economic Policy (ITEP). That includes nearly $7 billion in sales taxes and another $3.6 billion in property taxes. The ITEP report also points out that in the American agricultural sector, an estimated 16 percent of the entire industry is composed of undocumented workers. However, undocumented peoples make up a staggering 70 percent of the industry's fieldworkers, according to a March 2017 study by Farm Credit East (FCE). In New York state alone, the FCE study notes that 1,080 farms are in danger of significantly shrinking -- or failing outright -- due to ICE's enforcement measures. If the president has his way and every undocumented worker in New York were deported, the FCE study figures that the state's agricultural output would drop by 24 percent, or $1.37 billion. Twenty-one-thousand farm jobs would be subsequently lost, including those held by US citizens, along with another 23,000 jobs in adjacent service sectors (i.e., the local economies where undocumented workers spend their money). The economic impact for New York would be staggering: Nonfarm activity in the state would drop by $7.2 billion, according the the FCE study. "If we don't have the ability to have workers on our farms, farms can't survive," New York Farm Bureau spokesman Steve Ammerman told Crain's in 2017. And that's where automation will come in, eventually. "Automation is the priority for the industry, understanding that in the future, labor is going to be limited," Sankaran said. "There's a lot of emphasis on machine learning approaches on how to automate it." Farmers have relied on increasingly complex farming implements since the advent of the ox-drawn plow. But even today's industrial-scale planters, weeders and harvesters require human oversight to properly function. "The farmer really has to be there because only the farmer knows how to farm -- the computer doesn't," Kraig Schulz, the co-founder and CEO of Autonomous Tractor, told NBC News. 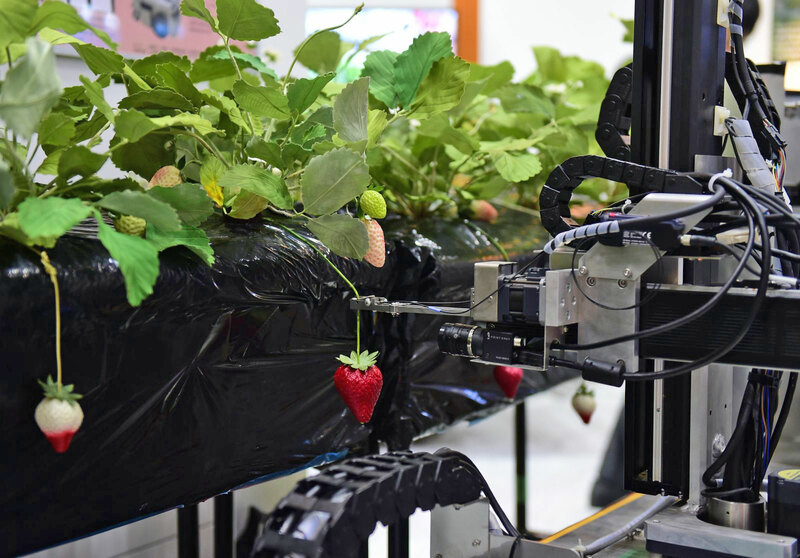 Automation holds the promise of eliminating the need for such operators, reducing expenses for the farm, insulating it from the effects of labor shortages and increasing efficiency. "In tens of millions of acres in the US, there's not really people who want to go out and pull weeds in the 100-degree heat," Ben Chostner, a Blue River Technology executive, told NBC News in 2017. In fact, John Deere acquired Blue River Technology in 2017 for $305 million to help augment its two-decade efforts to develop a fully autonomous tractor. John Deere's precision-agriculture products already utilize a degree of autonomous function in their operations, using GPS to remotely guide harvesters and optical sensors to evaluate the quality of grains as they're being harvested. However, automated weed killers like the one from ecoRobotix could someday be tasked with the monotonous job of spritzing interloping plants in field after field of row crops. The company claims that its machines can reduce the amount of herbicide needed by a factor of 20. At the Sixth Asian Conference on Precision Agriculture in 2016, Professor Simon Blackmore of Harper Adams University explained to the assembled crowd that the precision-agriculture industry is getting tantalizingly close to fully autonomous operation, which should significantly increase efficiency. "Precision agriculture is becoming robotic agriculture," he said. That said, as Dan Harburg of Anterra Capital told AgFunder News last year, "The robots that will be used in food and agricultural applications will have to be much more flexible than what we've seen in automotive manufacturing plants in order to deal with natural variation in food products or the outdoor environment." And it is still unclear as to when we'll actually reach the cusp of this robotic revolution. When Case IH AFS harvesting introduced its autonomous concept vehicle in 2016, it was just as much to showcase the future of farming as to gauge interest in the technology, Leo Bose, the company's marketing manager, told Successful Farming in 2017. "It's not a product launch by any means, but it could certainly lead to one -- or several -- down the road." Until that time comes, America's agricultural industry appears incapable of absorbing the economic impact of mass deportations as prescribed by the Trump administration.